The airplane is a seven- to ten-place, pressurized, all-metal, low-wing, twin-engine, turboprop airplane with retractable landing gear. 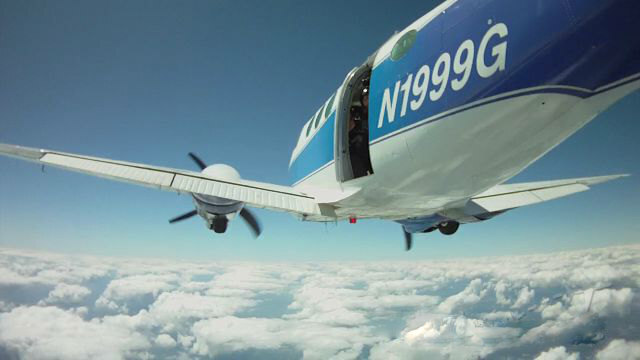 The King Air F90 is powered by two Pratt and Whitney turboprop PT6A-135 engines, each rated at 750 shp. They are three-stage, axial-flow engines, with a single stage compressor and single-stage reaction turbine. A pneumatic fuel control schedules fuel flow. Propeller speed remains constant within the governing range for any given propeller control lever position. The airplane fuel system consists of two separate tank systems, one for each engine, connected by a common crossfeed line. Each of the tank systems is further divided into a main and an auxiliary system. Each main system consists of a nacelle tank, two wing leading-edge tanks, all of which gravity feed into the nacelle tanks. Each main system has a total of 194 usable gallons. The auxiliary fuel system consists of a 41-gallon usable fuel tank located in the wing inboard of the engine nacelle. It employs an automatic fuel transfer system to supply the fuel to the main system. Each engine drives a high-pressure fuel pump and a low-pressure boost pump. In addition, and electrically driven low-pressure standby boost pump is in the bottom of each nacelle tank. The airplane electrical system is a 28-VDC system which receives power from a 24-volt, 34-ampere hour nicad battery, two 250-ampere starter-generators, or through an external power receptacle. A hot battery bus is provided to power certain convenience lights, emergency equipment, and other items. These items have power available at all times, regardless of the BATT switch position.